Inspired by Claire Brock’s biography of Caroline Herschel I found Pandora’s Breeches by Patricia Fara which is a broader survey of women in science during the enlightenment – from around 1500 to 1800. Fara is interested not only in the people but also the methodology of history. Early on in the book she lays out a manifesto for a better history that doesn’t seek lonely heroes, as is often the case in history of science books. That’s to say her aim is not to simply replace the men in a normal scientific biography with women. As inspiration she cites books like Jenny Uglow’s Lunar Men which is an ensemble of biographies covering several people – I approve of this approach! The chapter headings are pairings of woman and man, for example, “Anne Conway / Gottfried Leibniz”, at first sight this seems wrong. Surely this is a book about women in science, why tie each of them to a man? But actually it fits with the logic of the book, these women did not operate in isolation but neither did their male counterparts. Their male counterparts benefited from the more or less formal community of “scientists”, and those that had gone before them. But those male counterparts also benefitted from the practical support of their wives, daughters, sisters, other family members and friends. This book shows that practical support was not simply “she made him dinner so he didn’t have to”, it was in correspondence and the exchange of ideas, it was in the practicalities of running a laboratory at home, it was in the translation and explanation of scientific ideas and in the salon. To this group of women should also be added the invisible horde of male helpers, workmen and assistants who also go largely unmentioned. The book starts by considering how nature has often been represented as a woman, whose intimate parts are accessed, or unveiled, or probed by scientists (usually men). In engravings from the Enlightenment period nature is often represented by a female form. This is not a framing that has disappeared, this quote by a geologist is from 1980: “Her flanks are shuddering… we don’t know of her intentions. Scientists haven’t been able to probe her deeply enough with their instruments”. This may seem a harmless piece of flowery prose with more than a hint of sexual innuendo but it should be read in a context of a stream of scandals, at the very least in the US, where senior male scientists have acted inappropriately towards women at universities. Francis Bacon, very much the father of the modern scientific method, explicitly rejected women from his new science. A lead followed by the Royal Society who accepted men regardless of nationality and religion but could not abide women. The book is divided thematically, the first few chapters are on aristocratic women and how they corresponded with and nurtured men who are now far more widely known. This was part of a system of scientific endeavour which was very different from that found today. There was no profession, only the sponsorship of monarchs and the wealthy. Fara discusses Elisabeth of Bohemia, and how she pushed Descartes to explain his ideas fully and Émilie du Châtelet who lived with Voltaire, conducting her own experiments and translating Newton’s Principia, although “translate” underplays greatly her work. This network was known as the Republic of Letters, and Fara highlights how women played a part in it. The next theme is on women and science in domestics settings. Prior to the 19th century, science took place in the home which was typically managed by the women of the house. Science was an all consuming passion which inevitably brought in other members of the household. Marie Paulze Lavoisier was the wife of Antoine Lavoisier and was clearly deeply involved in his chemical experimentation, she is shown recording the results of experiments in a drawing of the time and was also responsible for highly detailed diagrams of the equipment used in their laboratory. As well as this she arranging for the publication of his work after he was executed during the French Revolution. 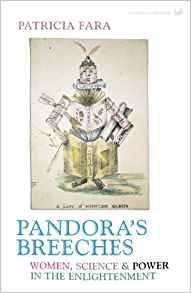 The women in Pandora’s Breeches were, in general, heavily engaged in the scientific endeavour. That is to say they did the things they did because they wanted to not because they had been dragged in by their men folk. This struck me particularly in the case of Elisabetha Hevelius who went out of her way to marry the much older, widowed Johannes a merchant and brewer with a substantial rooftop observatory, driven by her passion for astronomy. Priscilla Wakefield, who wrote Introduction to Botany along with 16 other textbooks, also falls into this class. She wrote, quite deliberately, for a large audience with a view to earning money from her writing. The book finishes with Mary Shelley and Victor Frankenstein. Frankenstein is about how science fits into the wider world. Here Fara highlights that these women of 200 years and more ago did not have the same aims as feminists today, education for women was not generally promoted as a route to equality rather a way by which women could become more useful and pleasing to their families. Throughout the book Fara highlights that these women are just those for which some written record remains, because of the prevailing culture of the time discoveries which were in truth joint efforts were written down solely to the “great man of science”. This book is definitely worth reading, it brings to light different facets of the development of science and it is highly readable. 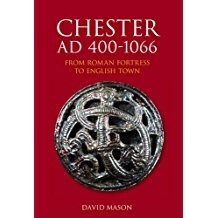 I couldn’t resist more Chester history, so now I am reading Chester AD400-1066: From Roman Fortress to English Town by David Mason. I’ve just read Jane Laughton’s book on late medieval Chester covering the period 1275-1520 (review here), and read David Mason’s book on Roman Chester (review here) towards the end of last year. This book fills most of the gap between those two books, but not quite. Evidence for the early part of the period is sparse, particularly in the earlier years between about 400AD and 600AD – it isn’t known as the “Dark Ages” for nothing. During this time, after the Roman withdrawal, no durable mass-produced items such as coins or pottery were being produced. Elsewhere, in nearby Wroxeter, archaeological evidence suggests that the early Britons built wattle-and-daub huts within substantial Roman buildings. In Chester there is little such evidence. The various Roman buildings in Chester would have decayed at different rates. The baths under the now Grosvenor Shopping Centre had metre thick walls and would have only fallen down slowly, whilst the barracks in the north east quarter of the city were less substantial. At the barracks there are black deposits, possibly pigeon droppings, deposited between Roman and later date-able layers. It would seem that for most of the period from 400AD to 900AD Chester was a Roman ruin with some desultory farming and living taking place within its walls. A little after this earliest period to 600AD there are are some written records, such as the Anglo-Saxon Chronicles, and Bede’s History which were written some time – dozens, even hundreds of years – after the event. There are songs and poems from Wales, transmitted orally, which refer to the period. Chester enters the historical record of the period with the Battle of Chester in AD616, for which there is archaeological evidence in the form of a mass burial at Heronbridge, just south of the city. Here 120 skeletons were found dating to the same period as documentary evidence for the battle and with wounds consistent with dying in battle. St John’s church, founded in 689AD sits next to the old Roman amphitheatre from whose remains it was built, although there is some suggestion that Christians were martyred at the amphitheatre, so it wasn’t simply a case of being unwilling to carry heavy stones further than necessary! In common with the Roman period, and the later period covered by Laughton’s book Chester holds a key strategic position between Wales and Ireland on the one hand and the rest of England, variously inhabited by Dane’s and Anglo-Saxons on the other. I found some of the discussion here confusing with what I would refer to as “Celts” from Wales, the West Country, Scotland and Ireland described as “British” and those from Mercia and Wessex as “English”. The final third or so of the book is devoted to Chester as a burh one of the network of fortified towns set up by King Alfred – Chester was established in 907AD. It’s at this point that Chester appears to turn into a proper town, and a moderately important one at that. In the years after its establishment as a burh Chester had “moneyers” – effectively a mint, twice the size of London. This is reflected in the discovery of coins minted in Chester being found in Ireland and around the Irish Sea. The establishment of the burh mandated taxation and physical labour to build its defences and bridges – it’s likely in this period that the modern circuit of the walls was constructed. There is more archaeological evidence from this period and the start of some form of systematic written records, rather than the non-contemporaneous writing alluding to previous periods. It is during the period after the establishment of the burh that King Edgar holds his coronation in the city, in 973AD. By the time of the Norman conquest and subsequent Domesday census Chester had 431 houses and a further 56 belonging to the Bishop (presumably of St. Werburgh’s church which was founded by in Edgar in 758AD). It also had a system of laws and taxation detailed in the Domesday book. The book ends with Chester suffering a setback in the years after the Norman conquest as a result of its part in rebellion against the incoming King William. Chester AD400-1066 is a fairly slender volume but more readable than Roman Chester. As a result of the sparsity of the archaeological and written records for the period it is wider in its scope than books set before and after this period.